Do you know every device on your WiFi network? The new Fingbox wants to make sure you do, by monitoring and managing all devices connected to your internet. We tested out this gadget within our own network for our Fingbox review. Watch the video and read on to find out what we discovered, and to find a custom coupon code. You’ve probably heard of the Fing app before, which has exceptional ratings on Google Play and the App Store. 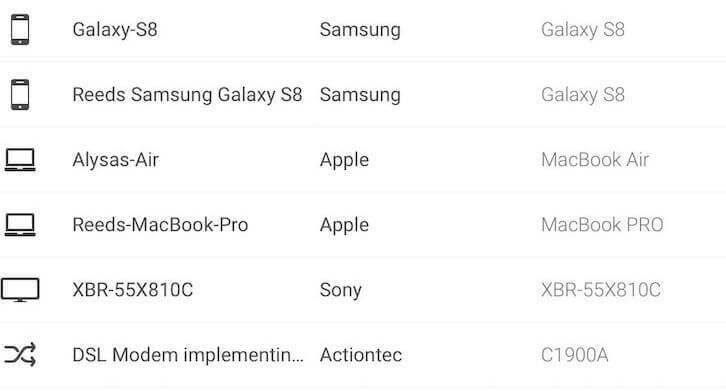 It’s a free network scanner that shows which devices are on your network and lets you block ones that are attempting to join. The new physical Fingbox enhances these features within the same app. Originally funded on Indiegogo, the network security device is available now on Amazon. 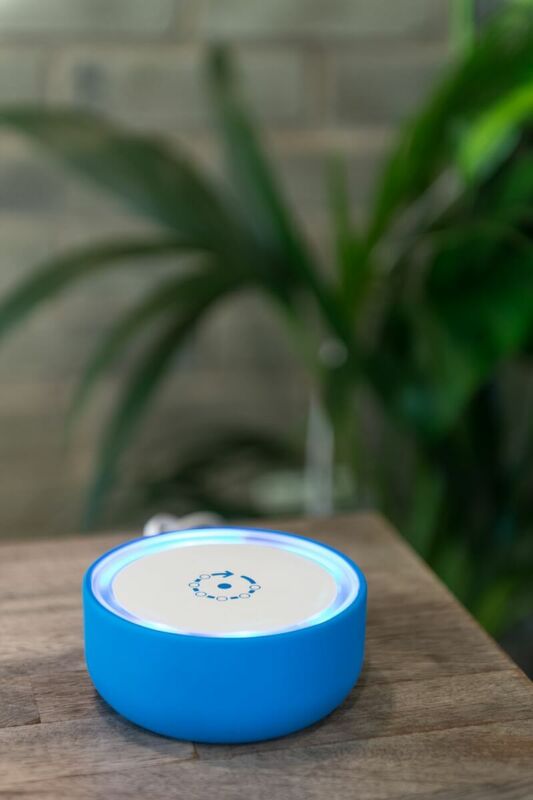 With Fingbox, you can analyze bandwidth, pause your internet connection, detect WiFi attacks, and much more. If you’re wondering if Fingbox is worth it, let’s find out what enhanced features it brings to your network. Plug the Fingbox into both your router and the power outlet. Open the Fing app and have it re-scan for the device. The app takes awhile to set itself up with your gadget, and in our Fingbox review we had to log out and back into the app because it was stalling for too long. But after we logged in again, the box was all set up with no issues. You will know that it’s connected when the status light on the top of Fingbox changes from green to blue. Once your Fingbox is up and running, it requires no more maintenance as it will automatically update. The Fing app is designed to monitor what devices are on your network. Fingbox includes all of the same functionality and more. If a device goes offline, Fing will alert you, which is great for smart home devices like security cameras. Fing can also recognize and alert you when a new device joins your network. In testing for this Fingbox review, the notifications came immediately. This keeps your router secure since you have the option to block or pause devices in one click. There are no monthly fees. There’s also no limit on the number of devices you can monitor. One drawback we found in our testing is that you can’t scan the network or pause while you are away from home. Since the device is attached to your router, it feels like this functionality should be available regardless of your location. You can view devices on your network even if you’re away from home, but that’s where the functionality ends. This is an interesting feature that lets you keep track of devices that are within your network, even if they are not connected. The Digital Fence is an always-updating list of all gadgets nearby, within around 50 feet of your router. 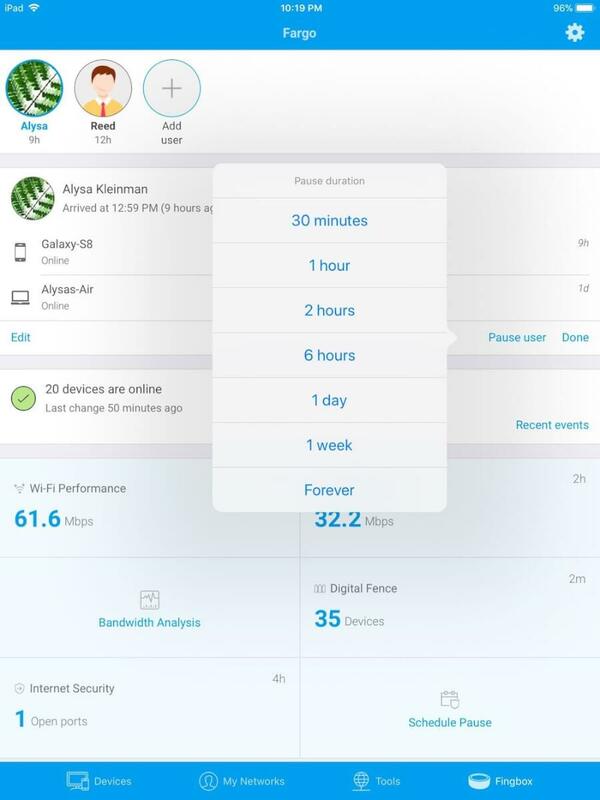 When you tap on one of the devices, you can watch it to receive alerts whenever it joins your network again. Fing says this is useful for tracking when someone like a dog walker comes to your home, but since we are big fans of smart locks and security cameras, we think those would be more useful than the Digital Fence for this use case. Regardless, it’s an interesting feature that may be useful to some users. As a parental control function, you can easily pause devices within the app. This is great for parents: their kids’ homework time can be distraction-free. The app also allows you to pause and resume all of a user’s devices at once for even easier controls. Another option is to automatically pause devices during specified times, like after 10pm each night for bedtime. You can name these scheduled pauses and they are easy to setup and manage. Fingbox scans for open ports to identify your risks for being hacked. It runs Internet Security checks weekly, or whenever you tell it to. This double checks that there are no vulnerabilities on your network. In addition to open ports, Fingbox is also looking at your router’s security, including its addresses, NAT configuration, and whether or not UPnP or NAT-PMP is activated. It can also detect “evil twin” access points or any devices that are eavesdropping onto your network. If any vulnerabilities are found, Fingbox notifies you immediately. 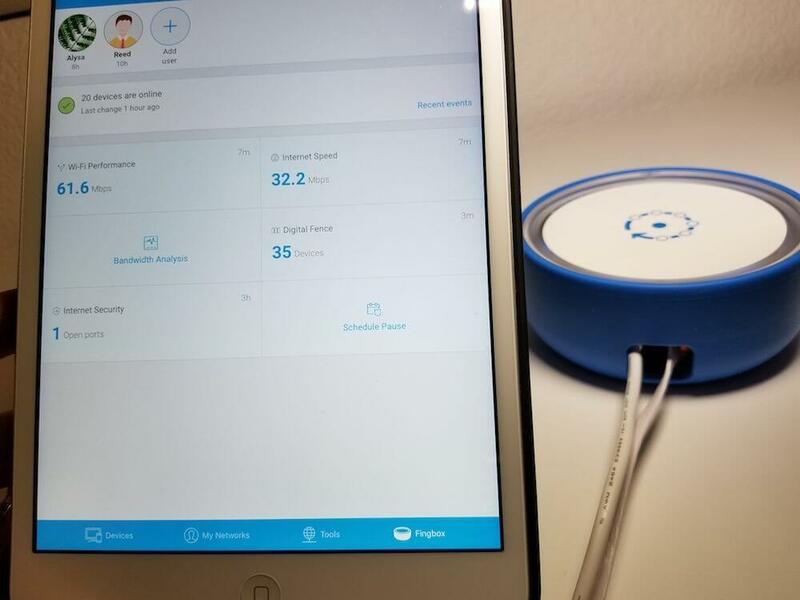 Unlike competitor firewall devices like Bitdefender Box, Cujo, Dojo, and Disney’s Circle, Fingbox monitors your network traffic without re-routing it. The only time it’s re-routed for specific devices is when you manually run bandwidth analysis, device blocking, or Internet pause. This is a big advantage because it doesn’t slow down your Internet since it only re-routes one device. In testing for our Fingbox review, our Internet speed was the same even after it was installed. However, Fingbox is not designed to monitor for malware or stop you from visiting malicious websites. For that functionality, you’ll want to buy a firewall device like Bitdefender Box. One of the biggest enhancements of Fingbox is its ability to check how much bandwidth each device is using to find out what is clogging up your WiFi. By simply running the bandwidth analysis tool, you can easily see what is using the most bandwidth on your network, then block those devices if they are slowing down your connection. Bandwidth analysis only runs when you tell it to, so you don’t have to re-route all of your traffic through the Fingbox. 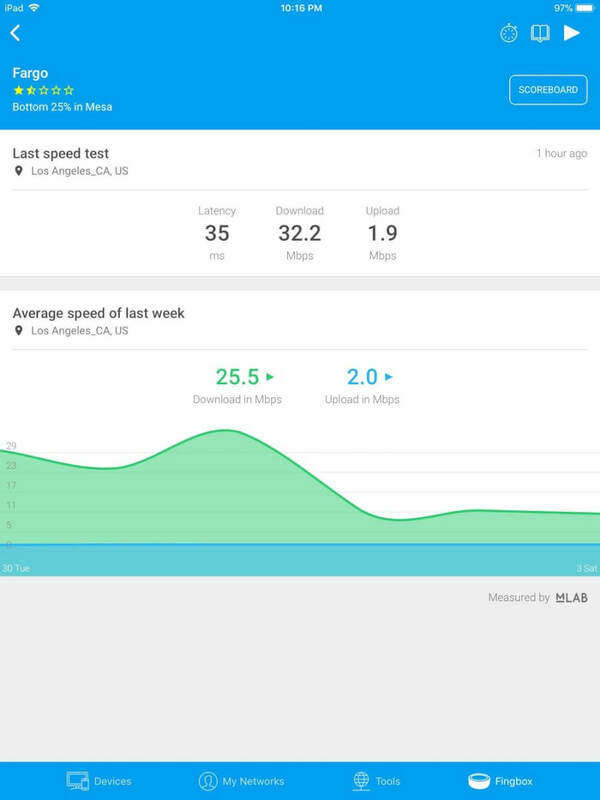 You can also test the speed of your Internet within the app, where you’ll see details about the download and upload speeds, latency, and even how your ISP ranks locally. You can schedule up to 6 speed tests per day and analyze this data in their performance graph. Another interesting option is to scan the speed of different areas of your home to find dead spots where your internet is slow. When testing, it will give you recommended video quality for streaming based on your internet speed. Additionally, Fingbox will track all Internet outages to show how reliable your connection is. Digital Fence notifications. If you specify that you want alerts when specific devices are within the proximity of your network, then you’ll receive these alerts as well. In addition to the ideas above, there are even more solutions in the Fingbox Facebook group, which you’ll certainly want to join if you decide to purchase the gadget. We were also very impressed with the amount of documentation on their website; every question we had was answered in their thorough Knowledge Base. 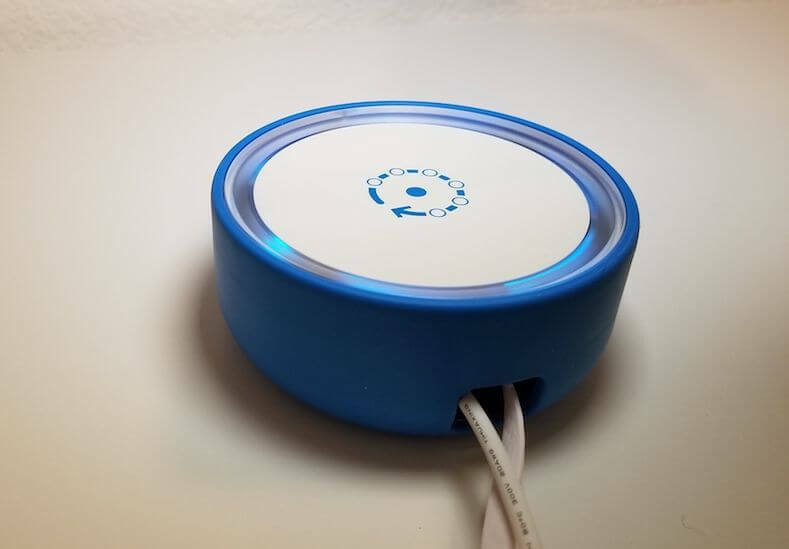 If you’re interested in purchasing Fingbox directly from their website, use our custom link with the coupon code SMARTHOMESOLVER for $10 off your purchase. 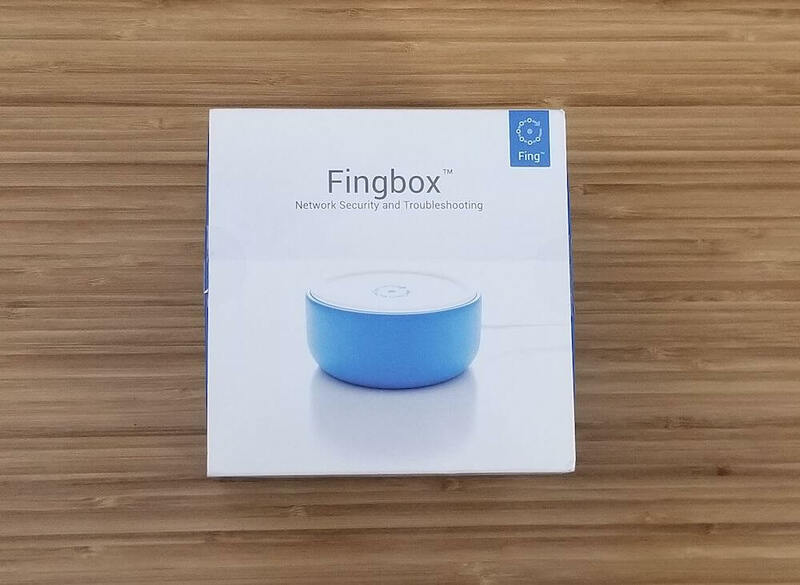 For the most part, this device worked well in our Fingbox review, and we can see this being a popular security device as more smart home gadgets are connected to the Internet.